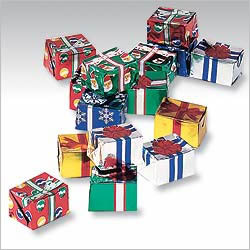 A set of 24 gourmet chocolates wrapped as colorful Christmas gifts. An ideal addition to any fabric or wooden Advent calendar. Also great for stocking stuffers, place settings, party favors, gift tie-ons and holiday candy dishes. Approximately 8 oz. total chocolate. Chocolate may contain traces of peanuts, other nuts, gluten, egg and cereals.